OM is a direct path: Remembering the sound vibration of AUM (or OM), along with a deep feeling for the meaning of what it represents (1.28), brings both the realization of the individual Self and the removal of obstacles that normally block that realization (1.29). In a sense, this practice is like a short cut, in that it goes directly to the heart of the process. Systematically piercing the levels: This practice takes one on a direct route inward, systematically piercing the levels of consciousness. It is done with sincerity and dedication (1.23) towards the untainted creative source or pure consciousness (1.24), which AUM represents (1.27). That consciousness contains the seed of omniscience (1.25), which is the source of the teachings of all the ancient sages (1.26). The pure consciousness itself that is represented by AUM is not colored the way that the samskaras are commonly colored (klishta, 2.3, 2.1-2.9, 2.10-2.11). It is also not subject to the playing out of karmas, nor do actions cause the creation of new samskaras (2.12-2.25). The pure consciousness identified by AUM is also the seed of pure knowledge or omniscience. That level of knowing is sought in the practice of OM. This pure consciousness, being eternal in nature, is the direct teacher of all of the ancient, earlier, or even the first of the teachers within humanity. In other words, some of the original teachers of humanity have learned directly from this pure consciousness, not from a human lineage of teacher-student, etc., whereby there is just a passing of information. This direct learning from the source continues to be available at all times and places, though the help of human teachers is surely a useful, if not essential aid. AUM has a vibrational quality along with other meanings, one of which is as a designator or term to denote the pure consciousness referred to in the sutras above. The word pranavah literally translates as "humming." 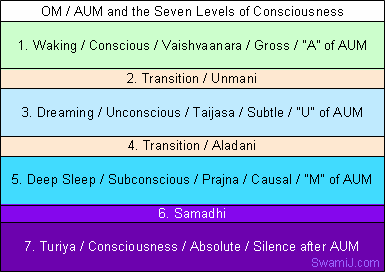 The lower curve represents the Gross, Conscious, and Waking state level, called Vaishvanara. The center curve represents the Subtle, Unconscious, and Dreaming level, called Taijasa. The upper curve represents the Causal, Subconscious, and Deep Sleep level, called Prajna. The dot, point, or bindu represents the fourth state, the absolute consciousness, which encompasses, permeates, and is the other three, and is called Turiya. The arc below the dot symbolizes the separateness of this fourth state, standing above, though ever remaining part of the other three. It is important to remember not only the vibration (japa), but also the deep meaning of the mantra, rather than to perform merely parrot-like repetition in the mind. Obstacles will be removed (1.30-1.32). It is a direct route to Self-realization. If one is able to sincerely, devotedly, intensely practice the AUM mantra in the depth of its meaning, it is a complete practice unto itself.